Air or steam blown through molten basalt produces strands of molten rock that are spun to make rockwool. 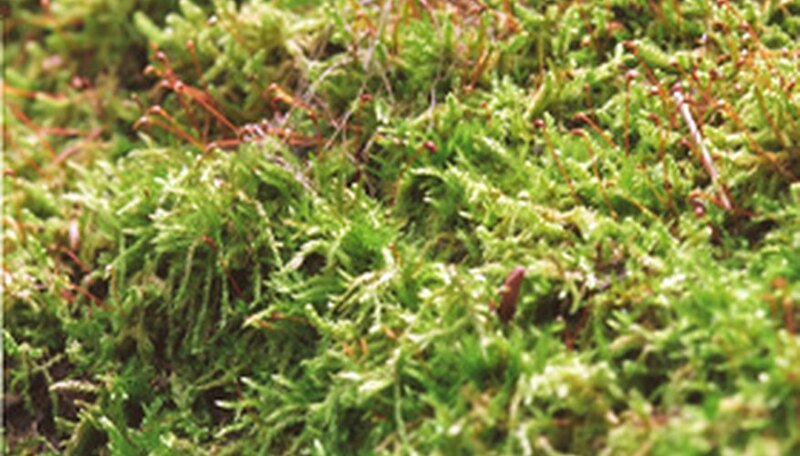 Sphagnum peat moss is the slowly decaying, dead moss that accumulates under moss living on the top of peat bogs. Rockwool, used mainly as a hydroponic growing medium, is also used to amend soil. Sphagnum peat moss is principally used to amend soil, potting mixes and compost, although it too can be used as a hydroponic growing medium. Spinning strands of molten basalt produce a mass of fine, intertwined fibers, a process that has been likened to that used to prepare cotton candy. Rockwool can be sprayed on walls to provide insulation and absorb sound. Treated to reduce its naturally high pH, rockwool can hold large quantities of water and air needed to grow roots in hydroponic systems. Used as amendment, it increases the air available in soils and composts. Many commercial hydroponic growers consider rockwool, sometimes called stonewool, as the growing medium of choice. Cup-sized hydroponic cubes are sold to hold seeds for germination and individual seedlings for starts; slabs of rockwool are marketed to anchor the roots of growing plants in beds. Rockwool holds water well and retains air, both necessary for spreading roots; it drains slowly and steadily giving growers more control over plants as they grow and fruit. Plants are easily able to draw water from rockwool, and they don’t show water stress until the medium is almost completely dry. Rockwool is amenable to automated systems that measure moisture content to control irrigation, and systems that monitor nutrients so that fertilizers can be drip-fed as needed. Use rockwool in either hydroponic ebb-and-flow or drip irrigation systems. It is suitable for growing seed, seedlings, and plants of all sizes. Dry cells float sphagnum moss to the top of a peat bog so it can get sun for photosynthesis. Since sphagnum moss gains its nutrients from water, its dry cells can soak up to 20 times its weight in water. Beneath the living sphagnum moss, sphagnum peat moss decays slowly because water lacks the oxygen needed by bacteria that causes rapid decomposition. Sphagnum peat moss is steamed to sterilize it for horticultural use. The long, sponge-like strands of sphagnum peat moss hold large quantities of water and give roots plenty of air. Sphagnum peat moss is a good growing medium for net-pot or lattice hydroponics systems where its long strands can spill out of holes and soak up water. The main problem is that it can decay over time, shedding small particles that can clog drip emitters and pumps. By blending sphagnum peat moss or rockwool with compost, help keep your soil from compacting and becoming hard. The main difference is that rockwool is inorganic and not biodegradable; it does not decay. Sphagnum peat moss decays over time. Compost amended with sphagnum peat moss compost will last four to five times longer. Both sphagnum peat moss and rockwool are blended with perlite, vermiculite and other media for use as planting mixes in pots and flats. Sphagnum peat moss is more often used in such mixes, and it is also popular for hanging baskets and for growing mushrooms. Used as a soil amendment, both sphagnum peat moss and rockwool save on fertilizer by reducing the leeching of nutrients. They help sandy soil retain moisture, and they loosen heavy, clay soils, preventing them from compacting. Sphagnum peat moss is generally cheaper than rockwool. Rockwool, like fiberglass, is a mineral wool that can damage your lungs if you inhale its particles in the form of dust. What Are the Characteristics of Clay Soil? What Kind of Sand Is Used for Brick Patios?